My parents and I went out for dinner at a Shanghainese restaurant near home. I ordered the stir fried rice cake (chao nian gao, in Mandarin) so you guys can see another variation of the rice cake dishes! 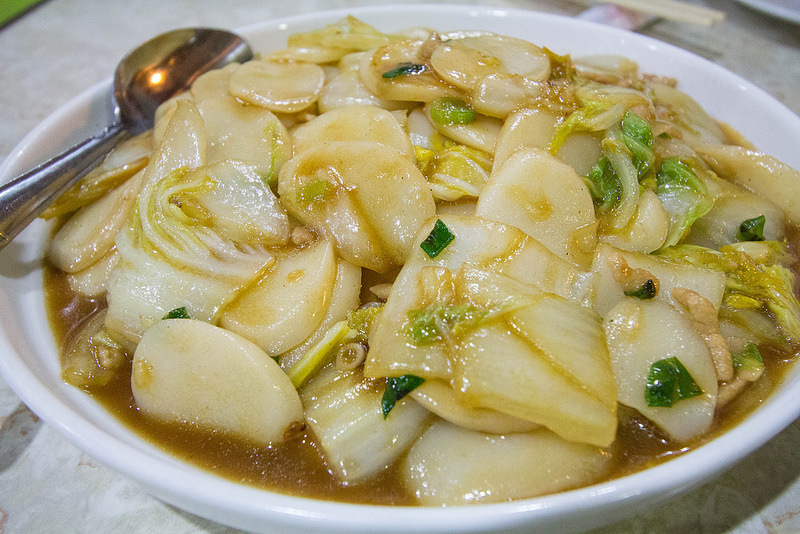 Shanghai style rice cake; chewy rice cake with cabbage, pork, and green onion. The Shanghai nian gao style is usually packaged in a thick soft rod to be sliced up or packaged pre-sliced and either stir-fried or added to soup. Depending on the cooking method, this style is a soft to a chewy variant. The Shanghai style keeps the nian gao white, and made with non-glutinous rice. The color is its distinct feature.